Had a fun and pleasant day tour to salay area and Mt. Popa. Our guide Aung is patient and very knowledgeable as he explains the history and culture of his people and the place to us. Highly recommended tour to do if you're in Bagan. 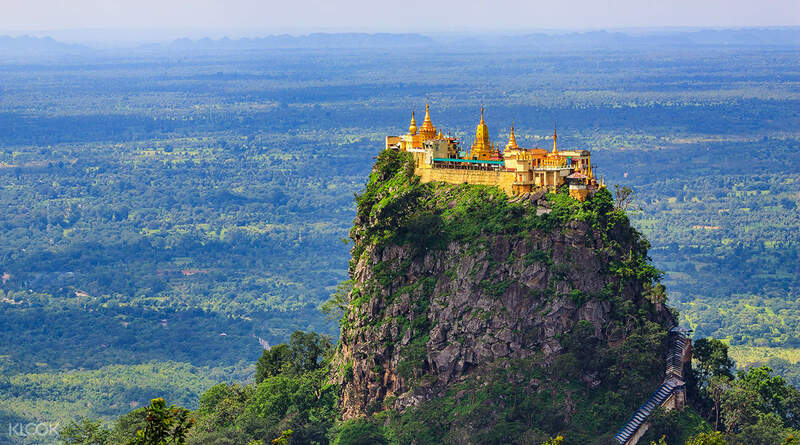 The beautiful historic features of Bagan are yours to discover on this day long tour that takes you from Salay's Youk Sone Monastery to Mount Popa. Your journey begins when you are picked up right from your hotel by the tour staff and then led to the historic sights of Salay, a town about 15km south of Bagan where you will explore the Youk Sone Monastery. 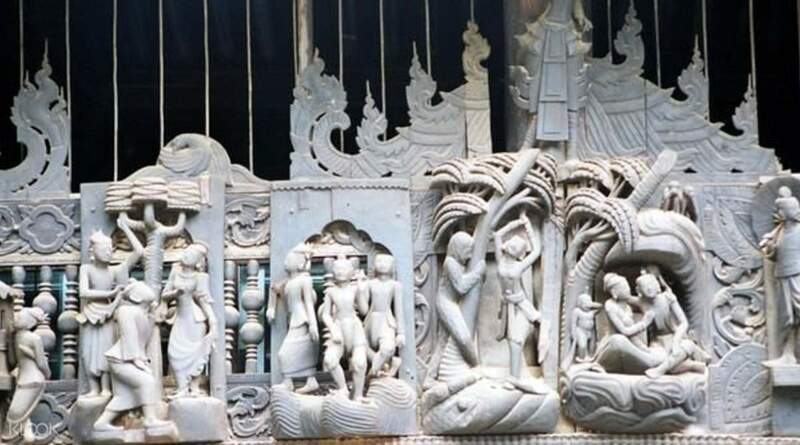 This old wooden monastery is filled with stunning wooden features, and decorated with traditional Myanmar arts and crafts. A visit to the Man Pagoda will reveal Buddha portraits and antiques adorned in laquer, gold and silver; truly a sight to behold. After a lunch at Popa Mountain Resort, your guide will take you up towards Mount Popa, with 777 steps towards the Nat (spirit) temples. This mountain is an extinct volcano 1,518m above sea level. Here you will learn about the ancient Burmese animist spirits said to still be residing inside. Finally, you will be dropped off at your hotel in Bagan for the evening, all the richer for the experience. The tour guide and driver are punctual for pick up at hotel. They can speak simple English which is easy for us to understand. Scenery at Mount Popa is beautiful but climbing up the steep steps to reach mid of mount popa is the most tiring! Monastery at Salay has many nice wood craft and Buddha statues. The lunch at Salay House is good too especially the Fish Curry and wide selection of choices from menu. We are seated at the garden for our lunch, quite nice ambience. The tour guide and driver are punctual for pick up at hotel. They can speak simple English which is easy for us to understand. Scenery at Mount Popa is beautiful but climbing up the steep steps to reach mid of mount popa is the most tiring! Monastery at Salay has many nice wood craft and Buddha statues. The lunch at Salay House is good too especially the Fish Curry and wide selection of choices from menu. We are seated at the garden for our lunch, quite nice ambience. Our guide and driver were super helpful and friendly. The guide Zhoe has guided us through various touristic sites outside Bagan region - furthest to Mandalay area, and answered our questions with high patience. He has a passion for his nation, and cares so much for their people despite they are of different social status, race, and religious belief. He is also considerate to observe our needs, and customize some part of the tour for us. The driver didn’t speak much but was so kind that he opened the door all along the journey whenever we get on or off the car. These dual travel assistants have made our journey very pleasant, and I would definitely recommend this tour. Our guide and driver were super helpful and friendly. The guide Zhoe has guided us through various touristic sites outside Bagan region - furthest to Mandalay area, and answered our questions with high patience. He has a passion for his nation, and cares so much for their people despite they are of different social status, race, and religious belief. He is also considerate to observe our needs, and customize some part of the tour for us. The driver didn’t speak much but was so kind that he opened the door all along the journey whenever we get on or off the car. These dual travel assistants have made our journey very pleasant, and I would definitely recommend this tour. I think the company missed our booking. We booked the night before to check. At times, we don’t understand the guide. But he’s very attentive and sincere. He explained until we can understand him. Most of the time, we can understand him. I think the company missed our booking. We booked the night before to check. At times, we don’t understand the guide. But he’s very attentive and sincere. He explained until we can understand him. Most of the time, we can understand him. Our guide explained and shared his info clearly (we learnt a lot) and the driver took care of us well (came down to open door for us every single time). Bottled water was provided and at the end of the tour, refreshment towel/wet wipe was provided. Restaurant/lunch was delicious. Breathtaking view on top. Sheltered stairs all the way and being a temple/monastery, shoes have to be removed when climbing so just wear slippers/sandals will do for convenient. Our guide explained and shared his info clearly (we learnt a lot) and the driver took care of us well (came down to open door for us every single time). Bottled water was provided and at the end of the tour, refreshment towel/wet wipe was provided. Restaurant/lunch was delicious. Breathtaking view on top. Sheltered stairs all the way and being a temple/monastery, shoes have to be removed when climbing so just wear slippers/sandals will do for convenient. Had a fun and pleasant day tour to salay area and Mt. Popa. Our guide Aung is patient and very knowledgeable as he explains the history and culture of his people and the place to us. Highly recommended tour to do if you're in Bagan. Had a fun and pleasant day tour to salay area and Mt. Popa. Our guide Aung is patient and very knowledgeable as he explains the history and culture of his people and the place to us. Highly recommended tour to do if you're in Bagan. The guide, Mr Khant speaks good English and is well versed in his field. Places of interest were awesome and the restaurant we had lunch served nice food. The guide, Mr Khant speaks good English and is well versed in his field. Places of interest were awesome and the restaurant we had lunch served nice food. A pleasant trip! The tour guide is very attentive! A pleasant trip! The tour guide is very attentive! Very hassle-free with klook! I highly recommend it to everyone. Very hassle-free with klook! I highly recommend it to everyone.